Episode 131: Comic Creator Geekery with Jim Zub! 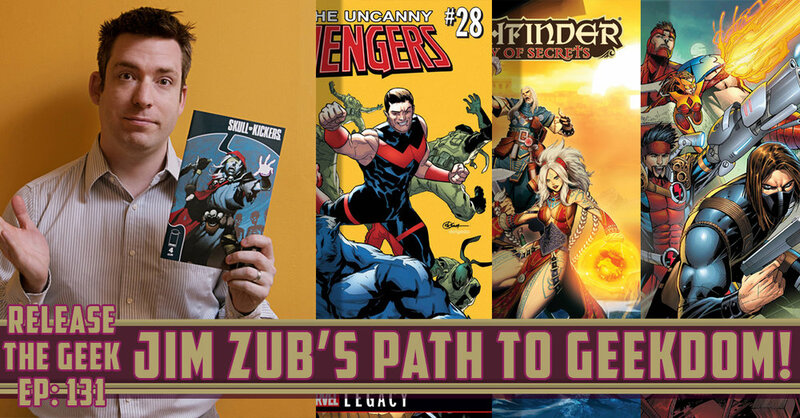 To believe Jim Zub's bio on his website, he's merely a writer, artist and art instructor based in Toronto, Canada, but that would belie the incredible amount of work Jim does. Not only does he currently have multiple comic projects on the go at one time, including The Uncanny Avengers for Marvel and Wayward, a modern supernatural story about teens fighting Japanse mythological monsters for Image ... but he's also an animation teacher and program co-ordinator for a local college. Further, he manages a Patreon account that truly gives you access to the 'behind the scenes' of his work, but also somehow finds the time to give new creatives advice through an amazing catalogue of industry tutorials as well as giving direct advice when he can via his Twitter feed. Jim was gracious enough to conjour an hour out of his hectic schedule to chat to us about many things including is path to geekdom, his love of roleplaying and comic books, how he got his start in the comics industry and what it was like to finally land the job of handling . Plus, Jim lets us know just how often he might drop some sneaky callbacks into his stories. Be sure to check out Jim's website for any amazing collection of helpful industry articles, and be sure to follow him on Twitter!